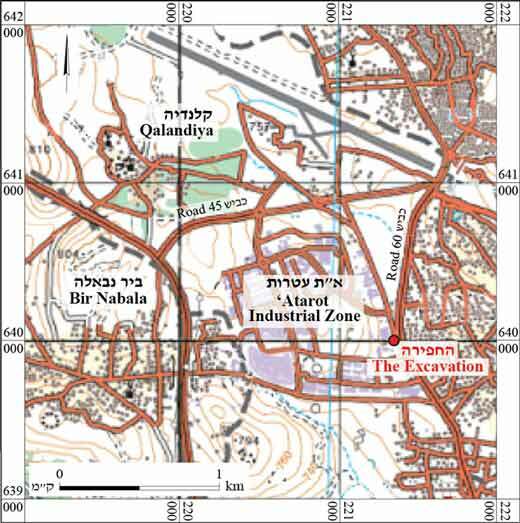 In May 2017, a salvage excavation was conducted on Beit Hanina Road in Jerusalem, along the outskirts of the ʽAtarot industrial zone, near the intersection of the airport road and Highway 60 (Permit No. A-8001; map ref. 221333–42/640008–20; Fig. 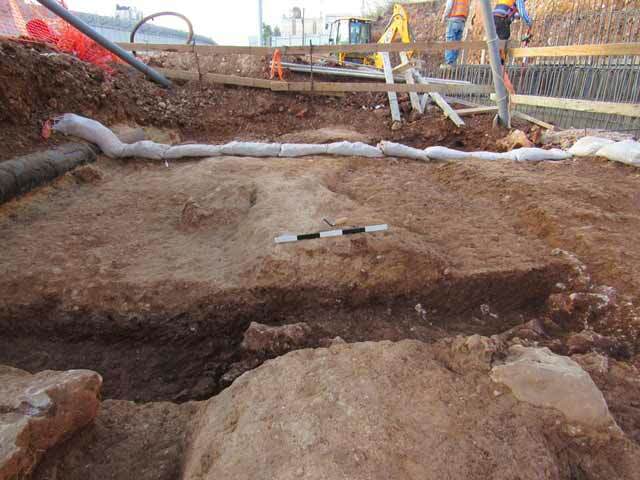 1), after ancient remains were discovered in an antiquities inspection prior to widening the road. The excavation, undertaken on behalf of the Israel Antiquities Authority and financed by the Moriah Company, was directed by D. Gellman (photography), with the assistance of N. Nehama (administration), D. Tanami (metal detection), V. Essman (surveying), N. Zak (plan), B. Touri (inspection, safety and digital documentation), I. Lidsky-Reznikov (pottery drawing), I. Raznitsky (metallurgical laboratory), C. Amit (studio photography) and R. Kool (numismatics). Two squares were opened, yielding remains of an ancient road (length 10 m, width c. 3 m; Fig. 2). The remains were damaged when modern infrastructure was installed, and therefore the road may have been wider. Other sections of the road, which was used in the Roman and Byzantine periods and led from Jerusalem northward—known as the Bet Horon or Nablus Road—are known from surveys and excavations. In those sections the road was preserved to a width of 4–5 m, and in most cases paved with stones. Remains of a rock-hewn Roman road were found at Khirbat ʽAdassa (North), c. 1 km southwest of the site (Kloner 2001: Site 1). 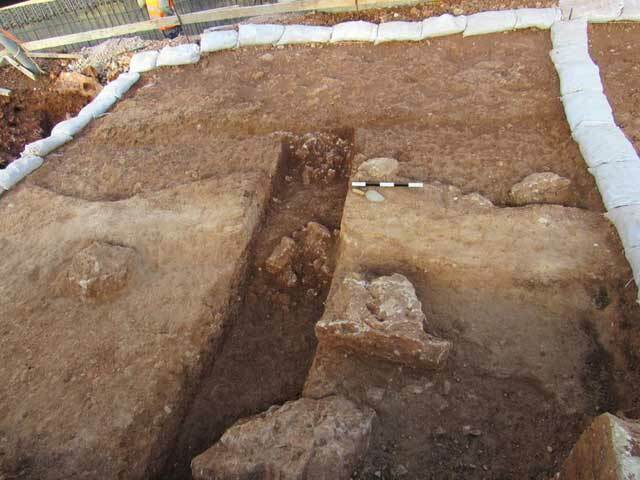 Remains of a Roman road flanked by built walls were discovered at Khirbat ʽAdassa (Southwest), c. 1.5 km southwest of the site (Kloner 2001: Site 5). At the ‘Fourth Mile’ site, c. 2.5 km south of the site, a segment of a stone-paved road (preserved width of c. 4.5 m), was exposed along c. 3 km (Kloner 2001: Site 28). Another stone-paved segment of the road (width c. 4 m), c. 3.5 km south of the site, was partly constructed on a slope and set on top of built terraces (Kloner 2001: Site 77). In 2004, another small section of the road, paved with stones as well, was exposed in the Beit Hanina neighborhood (Zilberbod 2008). 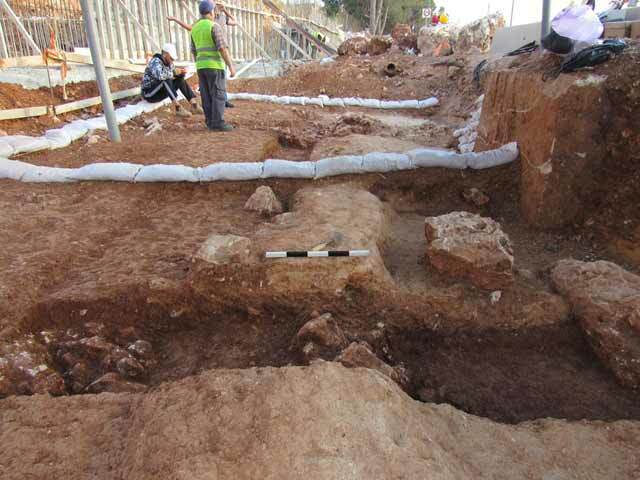 In 2007–2008, additional sections of the road were unearthed on Tahah Hussein Street and ‘Abd Al-Hamid Shuman Street in Beit Hanina, where several phases from the Hellenistic–Byzantine periods were identified (‘Adawi 2012). The road segment exposed in the excavation consisted of an upper level of crushed and tamped chalk (L3, L6; Fig. 2), deposited atop a bedding of pounded earth and fine gravel (L7; Figs. 2–4) set on the natural soil. The western margins of the upper level extended slightly further than those of the bedding, and this may have been the case on the eastern margin as well. In some parts of the excavation area both levels were preserved, but in the eastern part of the southern square only the foundation level survived. In several places, the road remains settled c. 10 cm below their original elevation. A trial trench was cut through the road remains to allow us to distinguish more clearly between the levels and to locate artifacts in a sealed context that would assist in dating the road (Fig. 5). Several non-diagnostic, abraded pottery sherds were found in the sealed layer of soil fill (L8). Judging by the characteristics of the sherds and the evidence of their production technique, they should probably be dated to the Roman period; thus, they provide a terminus post quem for the construction of the road. The potsherds recovered from the soil fill above the remains of the road included storage jars from the Early Roman period (Fig. 6:2) and from the Late Roman period (Fig. 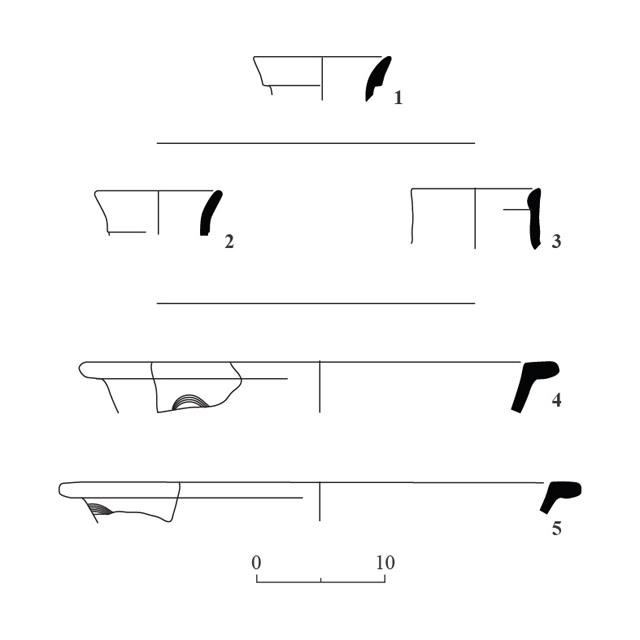 6:3), as well as numerous fragments of arch-rimmed basins from the Late Roman–Byzantine periods (Fig. 6:4, 5). These finds suggest that the road was built in the Roman period and may have continued to be used during the Byzantine period. The road was not as well-preserved in the northern part of the excavation, where it was destroyed by later activity. A layer of unworked stones of various sizes (L4; width c. 1.6 m; Figs. 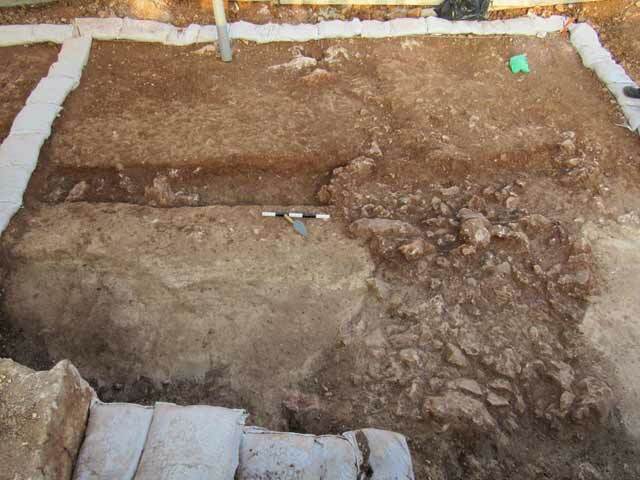 2, 7) was found spanning the entire width of the excavation square. The stone layer was aligned along an east–west axis and continued westward beyond the western end of the road remains and the excavation limits. The trenches dug during the construction work near the excavation revealed a streambed, whose course changed over time. The streambed was filled with stones, either as a result of the natural flow of alluvium or due to intentional blocking. Two coins from the late fourth – early fifth centuries CE were found among the stones making up the leveled surface and near them, beyond the western end of the road. Pottery sherds were also recovered, including a fragment of a jar from the Hasmonean period (Fig. 6:1). The origin of the stones and the soil between them is unknown; it may be alluvium or an intentional fill. Consequently, it is impossible to determine when this section of the road was destroyed. Kloner A. 2001. 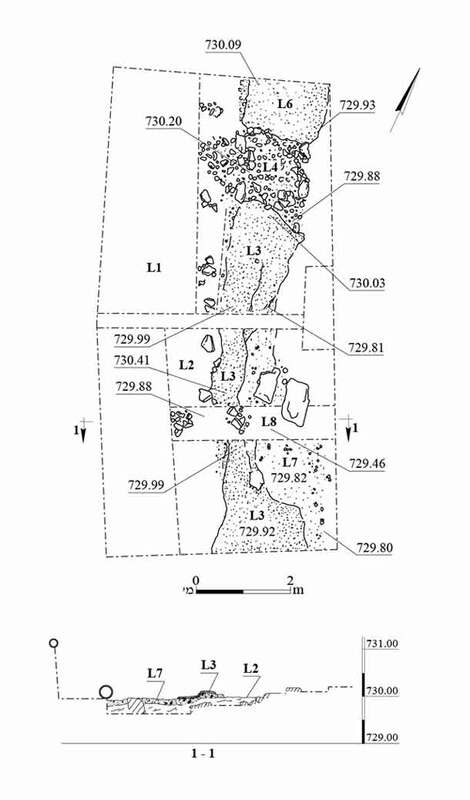 Survey of Jerusalem, the Northeastern Sector (102) (Archaeological Survey of Israel). Jerusalem. 2. The excavation, plan and section. 3. The two levels in the section, looking northwest. 4. The two levels in the section, looking southeast. 5. The southern square and the section, looking southwest. 7. A streambed(? ), looking southwest.